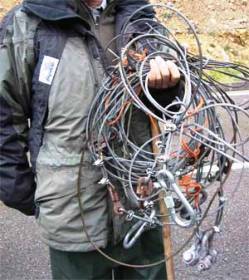 A person has been caught in the act of checking his illegally laid snares in the valley of the Ibias river in Asturias. The Fundación Oso Pardo and agents of Seprona have removed 17 traps in all in this area, near the borders of León. So far this year, 172 traps have been removed from the areas of the Alto Sil and Alto Narcea. The young bear with the trap caught around his abdomen has not been able to be caught and treated. It’s not known whether or not he is still alive.